I tend to be a bit of a skeptic about certain claims for instant cures. I wrote a post on Bentley’s fear of thunder a few months ago. I received several helpful suggestions and began researching them. 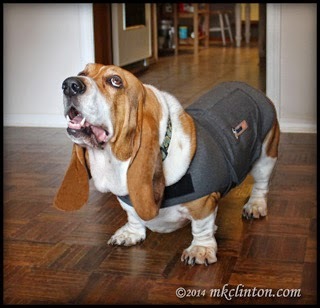 Several readers told me about their ThunderShirt and that it had helped their dogs. Honestly, I had my doubts about it working on Bentley. During the BlogPaws Nose-to-Nose awards ceremony, we dined with our friends from Meet the Furbombers and Dr. Anna Guthrie from Ask Dr. Anna. Our conversation ran the gamut, but it usually circled back to our four-legged family members. We discussed some of the things our pets didn’t like and I mentioned we had recently spent a sleepless night due to a thunderstorm. I asked Dr. Anna if she was familiar with the ThunderShirt. Indeed, she was and felt that it might help Bentley. She even offered to mail me one to see if it worked. I decided to take the plunge after she told me the ThunderShirt came with a money-back guarantee. Thanks a million, Dr. Anna! When we returned home, I measured Bentley’s chest and sent that information to Dr. Anna. In a couple of days, the package arrived. We tried it on to ensure that it fit and it was perfect for his size. The first time that you put it on your dog, I’d suggest that you have the illustrated instructions handy. Once you understand how it goes on, it is quick and simple. 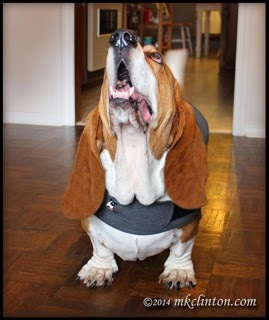 We placed the ThunderShirt on Bentley’s back and wrapped the short flap under his belly. Then, we wrapped the long flap under his belly and secured the fasteners onto the short flap. It fits snug, but not tight. Next, we wrapped the top flap down onto the long flap. The last step is to connect the neck straps. The fasteners are Velcro strips and seem very sturdy. Bentley seemed comfortable and the shirt did not restrict his movement at all. Wearing the ThunderShirt did not bother Bentley. All we had to do now was wait for a thunderstorm. Since weather is wacky around here this time of year, we waited for a couple of weeks. One afternoon it happened. The skies grew dark and the wind picked up; we were about to have a thunderstorm. Bentley immediately reacted to a very distant rumble. My husband and I brought him into the kitchen and put on his ThunderShirt. During thunderstorms, he usually reacts with pacing, panting, and hiding between the couch and loveseat. The worst part of it is the constant shaking. He trembles so hard that it breaks our hearts. We can’t get him to sit still to be comforted. He sticks like glue to my husband, although he does check on me frequently. He is an absolute nervous wreck. If thunderstorms are forecasted, we arrange to be home with him for the duration. It hugs his body and relieves anxiety. first thing that we noticed is that he wasn’t pacing as much. He sat or curled up by his dad a couple of times. When he came to me, I reached down to hug him and he wasn’t shaking! Not even a faint tremor. Those are all very major things for us. We could tell that he was still a bit anxious, but it was much better. The ThunderShirt works the same way that swaddling a baby works. It surrounds them with a gentle hug that provides a calming effect on the body. Yesterday another round of bad weather came in the afternoon. This time, we put his ThunderShirt on before it became loud. Bentley was asleep on the couch when we heard a very distant thunder. We wrapped him up and by the time the loud thunder hit, he was prepared. He was more at ease this time, but he did stay by his dad. I can say with certainty that it has helped him. Our big test will be during a nighttime storm. We have not slept through a thunderstorm in I can’t remember when. Bentley taps and paws my arm until I get up with him. Then, he does the same to his dad. We all get up and go sit in the living room while Bentley frets. At this point, I am optimistic in a good night’s sleep for all of us. If that happens, we will be ecstatic! I’ll let you know. Not only does it work, but he looks so handsome in his ThunderShirt. This is not a promotional review for the ThunderShirt. Many of you have told me that your dogs also suffer from anxiety due to storms, separation, and loud noises/fireworks. I wanted to share my initial results using the shirt in case you are looking for a solution. We bought ours at the price offered on their site, $39.95. It was money well spent for just stopping his shaking! They make a ThunderShirt for cats, too. Does your dog or cat suffer from anxiety? How do you deal with it? *** Psst, Bentley here to let you know that Bentley's Bargains has the Thundershirt at 30% off. Add my secret discount code; MAYFLOWER-15 and receive an additional 15% off. That is 45% off the regular price. Am I awesome or what?! We are co-hosting another fun Pet Parade with Rascal and Rocco, Basil the Bionic Cat's Blog, Jan’s Funny Farm, and Love is being owned by a Husky. Join us by linking your favorite post and social media to our Parade. No rules. All animals accepted, because we like everyone! I have my safe places that peeps calls my fallout shelters. The best one is behind the sofa. Peeps just lets me get on with it and it works for us OK. I hate boom booms but I cope. Have a fabulous Friday. This is AWESOME!!! LadyBug is exactly like Bentley...she is a WRECK during thunderstorms...and before they even start! I think she can FEEL them coming. Your post makes me want to run right out and buy one of those shirts today!! Thank you so very much for sharing this positive update with us...I, too, have been extremely skeptical! The reaction to wearing his shirt is amazing! Bentley wants me to tell you that he sells the ThunderShirt in his store at the bottom of this post. Use his secret code MAYFLOWER-15 for an additional 15% discount added to the 30% off and you can receive an eye-popping 455 off the regular retail price. LadyBug doesn't have to be nervous anymore! I don't really care about big noises or thundering, but Vaks is a wreck. Have a nice day. We were extremely impressed with the difference the ThunderShirt made. Give Vaks a hug from us. I absolutely believe in the science behind thundershirts. I have a friend with an autistic child, and pressure therapy helps her greatly. I have dental anxiety at the dentist, so wearing the lead that is used for xrays during the entire visit really calms me down. It explains on the ThunderShirt website about the use of pressure therapy for autistic children. I might need the lead shield during dental visits. Great idea! So glad to hear it helped...I often wonder why some dogs seem to react the way they do to storms. I have had over 20 dogs in my life time and have never had a single one that was scared of storms......I wonder if they pick up on nervousness from people. I am usually outside watching the storms...love seeing the lightening so maybe my dogs pick up in that. Bentley is the first that we've had to react to thunderstorms. I believe his fear became worse after we had an extremely violent storm that had us all hiding in the hallway. A huge tree crashed in our backyard, but we were lucky as several of the houses in our neighborhood had trees crash through their roofs. He also hates fireworks and refuses to go outside during New Year's Eve and Fourth of July. We hope his ThunderShirt helps. I hope that it helps Koda as much as it helped Bentley! He appreciates the stud comment! BOL! We have a Thundershirt for Rodrigo and it does help with him, but we rarely use it now, because I was able to work on myself to help him with his fear and anxiety. Yep, in my situation, it was me reinforcing his fear of fireworks and thunder storms. *sigh* - I should give his TS to someone who has serious anxiety, because there are tons of dog owners out there who could use this. That is a great idea. If you no longer need it, a ThunderShirt would make a great giveaway. You're right, it is a common anxiety. Bailey was fine as a pup, but developed storm issues as he got older. Katy seems to have full moon issues. I've considered trying it, but so far haven't convinced DH it would work. Like I said, I was incredibly skeptical too. After witnessing Bentley's trembling go away completely, I am a believer. You can save up to 45% on one in Bentley's Bargains. Just use his secret code MAYFLOWER-15 along with the regular 30% off and it is a steal. We paid full price for ours and it was worth every cent! Bentley, I can't believe you are scared of thunder! I would come and hang out with you, I am not afraid at all. Your thundershirt looks nice on you. They say human babies feel better wrapped tightly in blankets, must be a similar concept. Oh my gosh, Bentley is adorable!!! I have always had a soft spot for basset hounds. I've never had one, but I think they are too cute. I'm glad that you have found something to help Bentley with the thunderstorms. The Thunder Shirt sounds great! Awww, thanks so much. Bentley is our first Basset, but I am totally in love with the breed now. We've had breeds that are easier to train (he tends to be stubborn) but none that have absolutely stolen my heart like him. Wonderful that it worked so well. Curious if it would work well for fireworks, too? Did you see who's featured on the Pet Parade yet?!! Happy Parading! The ThunderShirt people say it helps with fireworks, separation anxiety, and thunderstorms. We will definitely put it to the test on the Fourth of July! He hates firecrackers too! We are thrilled to be the Featured Pet of the week on the Pet Parade!! Thanks! Believe me, I was just as amazed in the difference that it made in Bentley. I recommend it 100%. Wow! I was skeptical about the ThunderShirt, but it seems like it really does work. Bentley does look extra-handsome in it, too! :) Riley has never had an issue with thunderstorms; his only fear is the sound the freezer makes when it's making ice. It TERRIFIES him! Wow Chelsea, that is so odd - he's not afraid of thunderstorms but is afraid of the ice maker. That's a first. Interesting. Thanks for dropping by to see us. I am hoping it is as successful with fireworks as it has been with the thunder. I'll definitely be keeping everyone updated on our progress. How neat you are today's featured favorite at Pet Parade. Sam has a thundershirt for t-storms. We were very excited to see Bentley as the Featured Favorite. I love the Pet Parade and it is growing each week! Does the shirt work for Sam? Me and Stanley don't have too many troubles. We aren't scared of the vacuum or of fireworks. It rarely thunders here but so far that hasn't been a problem. What we fear is skateboards! Great review! Y'all are very brave! The vacuum doesn't faze Bentley. Pierre acts like he has been sucked up by a vacuum cleaner and tortured. He barks and pounces at it. We agree that you can't be too careful around renegade skateboards! I've got a Thundershirt, too. It works just fine! I hope that he gets better with each time we put it on him. Does yours help with fireworks? That's terrific! 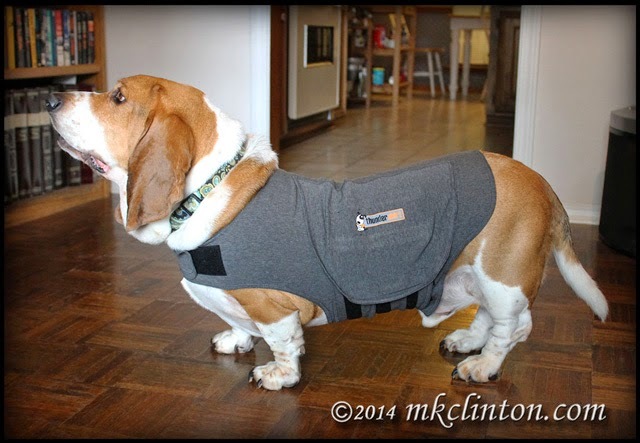 We are so glad the Thundershirt is working so well to help Bentley! Paws and fingers crossed that it will do the trick in an overnight storm, too. That is FABulous Bentley!! You look most FABulous in your Thundershirt!! I am so glads it is workin' for you!! Oh, I wanted to lets you know I gots my order from your MOST FABULOUS STORE! Everything arrived pawfecty, and delivered from Amazon! I wanted to do a bloggie promotion on your store, butts I was wondering if the pop up cart was secure? I didn't notice the famous 'Silver lock' on the pop up, and just wanted to be sure. There is so much great stuff at great prices, I want everyone to know about it! Thank you so much Ruby! I am very glad that you are happy with your purchase. The company does assure the pop up cart is safe and secure. It is really neat having my own store. I can feature items that Mom is talking about on any particular day. Today, I featured ThunderShirts! I'd love for you to tell your friends. I'm so glad that this is helping Bentley. He looks great in his Thundershirt. The Thundershirt is a great tool for all different kinds of anxieties and even a good training aid to help dogs focus. I can't thank you enough for helping me with our ThunderShirt. It really made a huge difference! That's great! We don't have t.storms here (well, maybe one every 7 years...) so no worries there with Rita. And she has no problem with fireworks (which is good since we hear the SeaWorld fireworks nightly all summer... But she goes nuts when the gardener comes or when folks come to do work around the house. It's such a hassle. I'm wondering if it would help calm her down... Although it's not so much anxiety as her protectiveness, so I'm not sure it will help. Guess I need to research other uses for the Thundershirt! What a great review and I'm glad it helped out Bentley. We sell them at our clinic and love them. So nice to hear great feedback.